Tuliptree scale, Toumeyella liriodendri, is an important soft scale insect pest of tuliptree (Liriodendron tulipifera L.) and other species in the family Magnoliaceae. It is most damaging to very young trees. 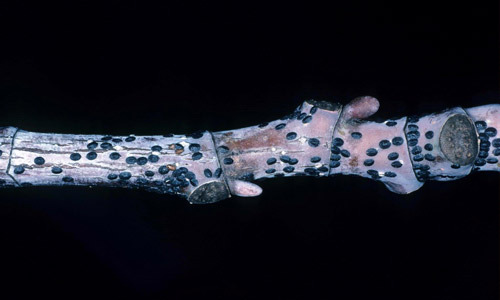 Scale insect feeding removes tree sap, reduces vigor, distorts growth, and sometimes causes death. Their damage is further compounded by the large amounts of honeydew they produce, which facilitates sooty mold growth. Tuliptree scale is widely distributed in the eastern United States. Figure 1. Adult female (left, orange) and male pupae (right, white) of tuliptree scale, Toumeyella liriodendri (Gmelin). Gerald J. Lenhard, Louisiana State University, Bugwood.org. Tuliptree scale is native to the eastern United States, with a similar distribution to that of its primary host, the tuliptree. It can be found in most states east of the Mississippi River, and is particularly common from New York, south. It also occurs in parts of the Midwest, Texas and California. Outside of the U.S. it is known only in Cuba, but likely occurs in parts of southeastern Canada as well. For a full listing of U.S. states where the scale has been found, see ScaleNet Toumeyella liriodendra. The taxonomy of tuliptree scale is reviewed by Burns & Donley (1970) and Kondo & Williams (2008). For the phenology descriptions below, note that in the southernmost range of the tuliptree scale, including Florida, the insect’s life stages may begin much earlier and activity may extend much later into the season. Eggs: Female tuliptree scales are ovoviviparous, which means that their eggs develop internally and hatch within the body. Newly hatched nymphs crawl out of their mother to find a suitable feeding site. Individual females produce an average of 3,000 offspring in their lifetime. 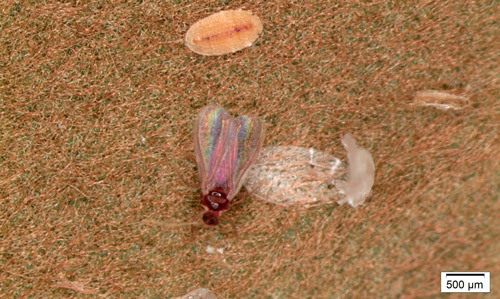 Nymphs: First instar nymphs, called crawlers, are dark red and 0.5 mm long. 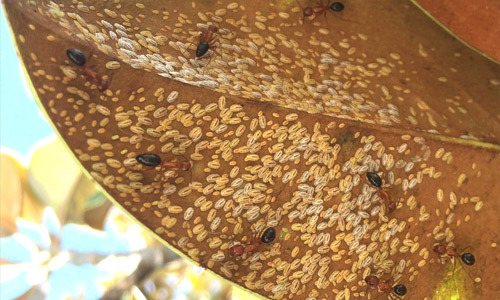 Unlike most scale insects, which emerge in the spring, tuliptree scale crawlers emerge, crawling out from beneath the stationary adult female, from approximately mid-August through October. The crawlers possess functional legs and are the only mobile female life stage (adult males are mobile). Crawlers disperse by crawling onto the new growth, moving from plant to plant directly, or being carried by wind. Their miniscule size allows for wind to carry them up to 30 meters away. Once landed they will resume crawling in search of a bud or young twig, but only a small percentage reach a suitable host. When a suitable feeding location is found the crawlers insert their mouthparts and begin feeding. According to Burns and Donley (1970) the crawlers are then unable to remove their mouthparts, and will remain in that spot for the rest of their life cycle. After a few weeks, male and female nymphs molt into the second, and final, instar (the overwintering stage) and functional legs are lost. This is unusual among soft scales, as females typically retain mobility into later instars, moving from foliage down onto woody tissues. Figure 2. Overwintering second instar nymphs of tuliptree scale, Toumeyella liriodendri (Gmelin), on a twig. Photograph by Lacy L. Hyche, Auburn University, Bugwood.org. Male pre-pupa: Around early May, nymphs begin sexual differentiation and the male nymphs become slim and elongated. Male pupa: A few weeks later, generally in late May, the males pupate. Pupae are tan, but appear white because of their conspicuous, opaque covering. Adult males: Adult males are small, have one pair of wings, and may be easily confused with parasitoid wasps. They emerge around mid-June to mate with females and die shortly after. Figure 3. Adult male tuliptree scale, Toumeyella liriodendri (Gmelin). Photograph by Lorraine Graney, Bartlett Tree Research Laboratories. Immature females: Around the same time that males begin to pupate, females develop their circular shape and begin a period of rapid growth. They become hemispherical and a distinctive flange-like lip appears around the lower half of their waxy covering. During this period, mid-May to mid-August, they produce copious amounts of honeydew. Adult females: The adult females are easily observable due to their convex shape and large size. There is considerable variation in reported sizes, usually ranging from 2.6-7 mm but with some as large as 12 mm. However, the higher estimates may be due to confusion with a similar but larger species, magnolia scale, Neolecanium cornuparvum (Thro). Adult females vary in color, ranging from orange to gray to pink, with gray to black speckling. During the summer, females are filled with eggs and their bodies swell so that the flanges flatten out. After the adult female dies towards the end of the season, it will turn brownish and may stay attached to the branch. Figure 4. Honeydew dripping from adult female tuliptree scale, Toumeyella liriodendri (Gmelin). Photograph by Chazz Hesselein, Alabama Cooperative Extension System, Bugwood.org. Figure 5. Adult female tuliptree scale, Toumeyella liriodendri (Gmelin). Photograph by Lacy L. Hyche, Auburn University, Bugwood.org. Tuliptree scales overwinter as immatures on twigs and evergreen leaves. With the onset of warm weather the nymphs begin more actively feeding on the host’s phloem, and mature during the spring. Males emerge in June to mate with females. Females produce thousands of offspring from late August to early autumn. The given phenology (life stage development over the seasons) estimates are most representative of the temperate climate range of the tuliptree scale, where there is one generation per year. In the extreme southern parts of its range, like Florida, life stages may overlap and all stages can be found during the winter. Throughout much of the tuliptree scale’s distribution the primary host is Liriodendron tulipifera L. (Magnoliales: Magnoliaceae) commonly known as tuliptree, tulip-poplar, yellow-poplar, and whitewood. Other important hosts are the native and cultivated deciduous magnolias, such as Magnolia grandiflora, Magnolia × soulangeana, Magnolia kobus, and Magnolia stellata. Less common hosts are lindens (Tilia species). In Florida, 85% of host records in the FDACS-DPI database are from Magnolia species, primarily Magnolia grandiflora. Other hosts include banana shrub, Magnolia figo (previously Magnolia fuscata,Michelia figo, Michelia fuscata), cape jasmine (Gardenia jasminoides), loblolly-bay (Gordonia lasianthus), buttonbush (Cephalanthus spp. ), and walnut (Juglans spp.). In total, tuliptree scale is associated with plant species in at least 12 genera and eight families. A complete host reference list is available at ScaleNet: A Database of Scale Insects of the World. Many ornamental trees are common hosts for this scale and have been widely distributed due to their commercial popularity, particularly Liriodendron tulipifera. Large tuliptree scale populations weaken or may kill young trees, but populations as few as 38 individuals have been reported to kill two-year-old trees. 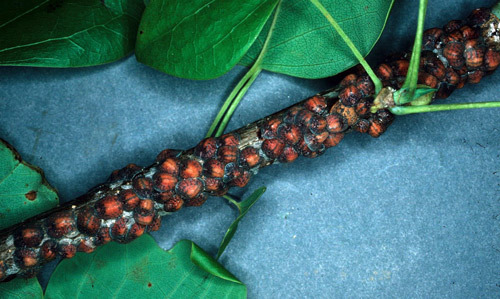 Tuliptree scale damages its host plant in more than one way. First, it removes large quantities of plant nutrients by feeding on plant sap. Second, waste excreted by this scale induces sooty mold growth on leaf surfaces, which interferes with plant physiological processes such as transpiration and photosynthesis. Symptoms that develop as the plant is weakened include yellowing leaves, premature leaf drop, and branch dieback. From an aesthetic viewpoint, the scale-induced distorted growth and sooty mold can significantly reduce the plant’s value and marketability. This has a direct negative effect on the nursery industry and ornamental plant trade. Tuliptree scale has also been found on Liriodendron tulipifera saplings planted for reforestation. 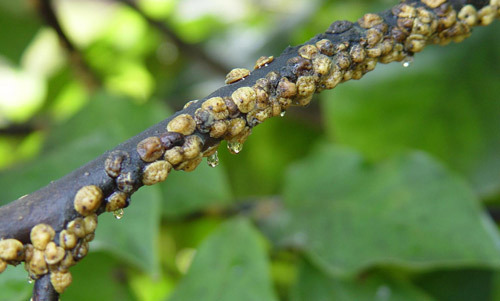 Scale insect populations are typically kept in check by natural and biological controls. However, they can occasionally become locally abundant, disrupting natural regeneration and eventually killing single trees or small natural stands. Figure 6. Symptoms of dieback from tuliptree scale, Toumeyella liriodendri (Gmelin). Photograph by Chazz Hesselein, Alabama Cooperative Extension System, Bugwood.org. Mechanical control: When feasible, removing scales by hand or pruning off and destroying infested plant material may reduce infestations. 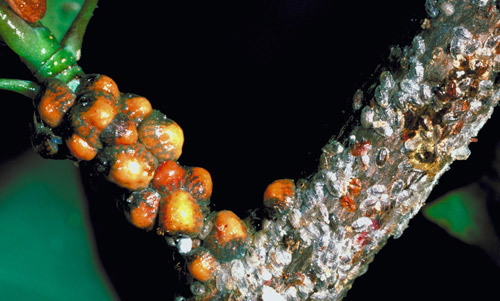 Other scale insect pests have been effectively controlled using high-pressure water sprays to dislodge them from the bark. However, this is only feasible for small trees and should be done during the dormant season when leaves are not present. Biological control: A number of natural enemies attack tuliptree scale, including: a predaceous moth larva, Laetilia coccidivora (Comstock) (Lepidoptera: Pyralidae); the ladybird beetles Hyperaspis proba (Say), Hyperaspis signata (Olivier), Chilocorus stigma (Say), and Adalia bipunctata (L.) (Coleoptera: Coccinellidae); a parasitoid syrphid fly, Pelecinobaccha costata (Say) (Diptera: Syrphidae); and the parasitoid wasps, Anicetus toumeyella (Milliron), Metaphycus flavus (Howard) (Hymenoptera: Encyrtidae) and Coccophagus flavifrons (Howard), and Coccophagus lycimnia (Walker) (Hymenoptera: Aphelinidae). Competition for prey or hosts is reduced among beneficial insects because they feed on or parasitize scale insects at different times of the season, thus season-long control can occur. For example, Hyperaspis proba begins feeding on nymphs early in the spring, Anicetus toumeyella emerges from hosts around late May, Laetilia coccidivora begins feeding around mid-July, and Pelecinobaccha costata is active from mid-July through the end of the warm season. Ant control is an important part of tuliptree scale management because ants facilitate scale insect outbreaks. At least 10 ant species are associated with tuliptree scale in a mutualistic relationship, tending them for honeydew in exchange for defending them from natural enemies. A few ant species also construct protective structures made of soil, grass, and mud over the scales. In Florida and other southern states, the invasive and noxious pest ant, Nylanderia fulva (Mayr), has been observed making these structures, called “carton shelters” or “tents”, over tuliptree scales on southern magnolia (Magnolia grandiflora). The role of ants should not be underestimated. A study showed that ants tending a scale population increased the scale insect survival by 50% compared to a population where ants were excluded (Burns and Donley 1970). Another study determined that the ant presence caused a 27-98% reduction in parasitism of a similar soft scale species (Bartlett 1961). Ant activity is a good indicator that scale insects are present even before sooty mold becomes obvious. Monitor for ants along tree trunks, branches, petioles, and leaves. Figure 7. Ants tending various stages of male tuliptree scale, Toumeyella liriodendri (Gmelin). Photograph by Adam Dale, Entomology and Nematology Department, University of Florida. Cultural control: Plant stress is associated with greater scale insect pest abundance on landscape ornamentals. Proper irrigation, fertilization and plant installation are critical for reducing plant stress. Selecting the appropriate plant species for the planting site is also critical for minimizing stress and maximizing plant tolerance to insect pests. Chemical control: Scale insect management using foliar or spray-based chemicals is difficult because the scale is covered with a protective waxy layer for much of its life cycle. Control methods should target the crawlers or early second instars. Insecticidal oils and systemic products are most effective at controlling scale insects. Consult your local Cooperative Extension Service office and utilize up-to-date UF/IFAS EDIS publications for current control recommendations. Bartlett BR. 1961. The influence of ants upon parasites, predators, and scale insects. Annals of the Entomological Society of America 54: 543-551. Burns DP, Donley DE. 1970. Biology of the tuliptree scale, Toumeyella liriodendra (Homoptera: Coccidae). Annals of the Entomological Society of America 63: 228-235. Burns DP. 1964. Formicidae associated with the tuliptree scale. Annals of the Entomological Society of America 57: 137-139. Burns DP. 1968. The Impact of tuliptree scale feeding on its host, yellow poplar. Ohio State University. Frank JH, Foltz JL. 1997. Classical biological control of pest insects of trees in the southern United States: A review and recommendations. Forest Health Technology Enterprise Team. Morgantown, WV. Kondo T, Williams DJ. 2008. Neotype designation and redescription of Toumeyella liriodendri (Gmelin) (Hemiptera: Coccoidea: Coccidae). Journal of Insect Science 8: 56. Krischik V, Davidson J. 2007. Tuliptree scale. 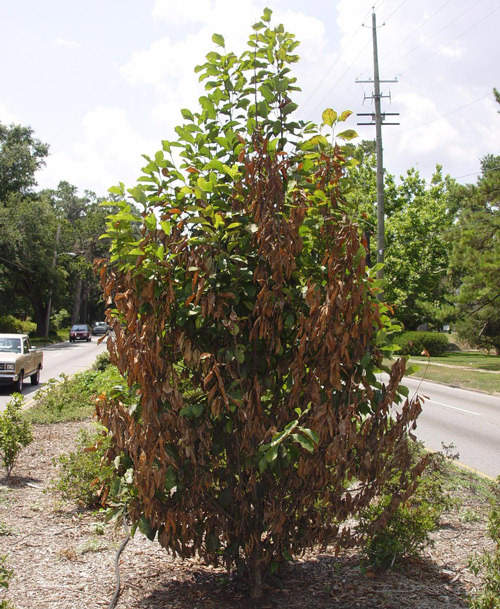 IPM of Midwest landscapes: Pests of trees and shrubs. University of Minnesota. Sharma S, Oi D, Buss E A. 2013. Honeydew-producing hemipterans in Florida associated with Nylanderia fulva (Hymenoptera: Formicidae), an invasive crazy ant. Florida Entomologist. 96: 538-547. Simpson, JD, Lambdin, PL. 1983. Life history of the tuliptree scale, Toumeyella liriodendri (Gmelin), on yellow-poplar in Tennessee. Tennessee Farm and Home Science. 125: 2-5. Van Driesche RG, LaForest JH, Bargeron CT, Reardon RC, Herlihy M. 2013. Forest pest insects in North America: A photographic guide. USDA Forest Service. Forest Health Technology Enterprise Team. Morgantown, WV. Photographs: Adam Dale, Entomology and Nematology Department, University of Florida, Chazz Hesselein, Alabama Cooperative Extension System, Gerald J. Lenhard, Louisiana State University, Lacy L. Hyche, Auburn University, Lorraine Graney, Bartlett Tree Research Laboratories.